View of the Thaa Atoll from the Maalifushi Water Villa Pool. 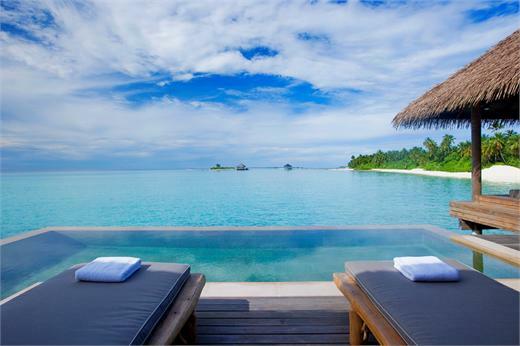 April 11, 2013 (Toronto, ON) – COMO Hotels and Resorts has announced it will open an exclusive new property in the Maldives this October. Maalifushi by COMO, an eight-hectare private island in the southerly Thaa Atoll, will be the company’s second resort in the Maldives. Its sister property, Cocoa Island by COMO, located further north in the South Malé Atoll, opened in 2002. Maalifushi by COMO will be reached by a 50-minute seaplane ride from the Maldives’s main airport at Malé. Tahiti Tourisme North America announces spectacular specials to the magical islands of Tahiti including Bora Bora, Moorea and Huahine. At only an eight-hour flight from Los Angeles, and seemingly a world away, the islands of Tahiti offer the ideal romantic escape to the South Pacific. (*) Prices are ‘from’, per person, based on double occupancy. Single supplements apply. Strictly subject to availability at time of booking. U.S. foreign taxes of approximately $90, incl. September 11 Security Fee are additional. Prices, itinerary and conditions are subject to change without notice. City tax of approx. $1.80 per person, per night is not included. (*) Prices are “from”, per person, based on double occupancy, valid for departures Jan 7 – Mar 25, 2011, otherwise, supplements will apply. Package must be minimum 6 nights at St Regis, based on special promotional rates.. Must be booked at least 120 days prior to departure. Single supplements apply. Strictly subject to availability at time of booking. U.S. foreign taxes of approximately $108, incl. September 11 Security Fee are additional. Prices, itinerary and conditions are subject to change without notice. City tax of approx. $1.80 per person, per night is not included. In just under an eight hour flight from Los Angeles, the islands of Tahiti boasts some of the world’s best snorkeling, scuba diving, outrigger canoeing, four-wheel jeep safaris, swimming, sailing, jet skiing, shark and ray feeding and delicious Tahitian cuisine. For more information or to book, visit http://www.tahiti-tourisme.com/iaoranatahiti/ or call (877) GO -TAHITI. About the islands of Tahiti: Easier to travel than often imagined, Tahiti is eight hours by air from Los Angeles with daily nonstop flights. Tahiti is halfway between California and Australia, on the same side of the International Date Line as North America and in the same time zone as Hawaii. There are a total of 118 islands and atolls that comprise this beautiful South Pacific country. Tahiti’s varied landscape ranges from just-above sea level coral atolls to volcanic mountain peaks. Tahiti is renowned for warm waters, white-sand beaches, stunning turquoise lagoons, lush green hills and abundant flowering plants.